Chelsea Place is at 13871 Laurel Drive near the Fraser Highway in Surrey. It was built in 1990 by the West Coast Community Homes Society and was acquired by New Chelsea Society in 2010. Just a 10-minute walk from the Central City Shopping Center and the King George Skytrain station, Chelsea Place offers access to the big city from a quiet neighborhood. 36 family townhouses; private, self-contained 2-storey units. Community building with area for meetings or children’s birthday parties. Playground on the property. Near shopping and public transportation. 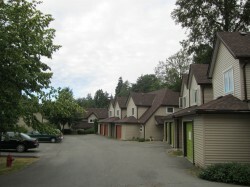 Single-car garage for each townhouse unit.